"Zedi" redirects here. For people named Zedi, see Zedi (name). Stupa in Gotemba, Shizuoka, Japan. A stupa (Sanskrit: "heap") is a mound-like or hemispherical structure containing relics (such as śarīra – typically the remains of Buddhist monks or nuns) that is used as a place of meditation. A related architectural term is a chaitya, which is a prayer hall or temple containing a stupa. In Buddhism, circumambulation or pradakhshina has been an important ritual and devotional practice since the earliest times, and stupas always have a pradakhshina path around them. The "Tomb of Midas" in Gordion, dated to circa 740 BCE. Royal funeral tumulus of King Alyattes, Lydia, 6th c. BCE. Amrit, Phoenicia, 5th c. BCE. Stupas may have originated as pre-Buddhist tumuli in which śramaṇas were buried in a seated position called chaitya. Some authors have suggested that stupas were derived from a wider cultural tradition from the Mediterranean to the Indus valley, and can be related to the conical mounds on circular bases from the 8th century BCE that can be found in Phrygia (tomb of Midas, 8th c. BCE), Lydia (such as the tomb of Alyattes, 6th c. BCE), or in Phoenicia (tombs of Amrit, 5th c. BCE). The Piprahwa stupa is one of the earliest surviving stupas. Religious buildings in the form of the Buddhist stupa, a dome shaped monument, started to be used in India as commemorative monuments associated with storing sacred relics of the Buddha. After the parinirvana of the Buddha, his remains were cremated and the ashes divided and buried under eight mounds with two further mounds encasing the urn and the embers. The relics of the Buddha were spread between eight stupas, in Rajagriha, Vaishali, Kapilavastu, Allakappa, Ramagrama, Pava, Kushinagar, and Vethapida. The Piprahwa stupa also seems to have been one of the first to be built. Guard rails —consisting of posts, crossbars, and a coping— became a feature of safety surrounding a stupa. The Buddha had left instructions about how to pay homage to the stupas: "And whoever lays wreaths or puts sweet perfumes and colours there with a devout heart, will reap benefits for a long time". This practice would lead to the decoration of the stupas with stone sculptures of flower garlands in the Classical period. An early stupa, 6 meters in diameter, with fallen umbrella on side. Chakpat, near Chakdara. Probably Maurya, 3rd century BCE. According to Buddhist tradition, Emperor Ashoka (rule: 273—232 BCE) recovered the relics of the Buddha from the earlier stupas (except from the Ramagrama stupa), and erected 84.000 stupas to distribute the relics across India. In effect, many stupas are thought to date originally from the time of Ashoka, such as Sanchi or Kesariya, where he also erected pillars with his inscriptions, and possibly Bharhut, Amaravati or Dharmarajika in Gandhara. Ashoka also established the Pillars of Ashoka throughout his realm, generally next to Buddhist stupas. The first known appearance of the word "Stupa" is from an inscribed dedication by Ashoka on the Nigali Sagar pillar (spelled in Pali in the Brahmi script as 𑀣𑀼𑀩𑁂 "Thube" ). Stupas were soon to be richly decorated with sculptural reliefs, following the first attempts at Sanchi Stupa No.2 (125 BCE). 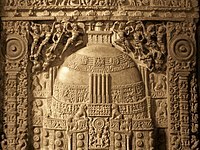 Full-fledged sculptural decorations and scenes of the life of the Buddha would soon follow at Bharhut (115 BCE), Bodh Gaya (60 BCE), Mathura (125-60 BCE), again at Sanchi for the elevation of the toranas (1st century BCE/CE) and then Amaravati (1st-2nd century CE). The decorative embellishment of stupas also had a considerable development in the northwest in the area of Gandhara, with decorated stupas such as the Butkara Stupa ("monumentalized" with Hellenistic decorative elements from the 2nd century BCE) or the Loriyan Tangai stupas (2nd century CE). Sanchi Stupa No.2, the earliest known stupa with important displays of decorative reliefs, circa 125 BCE. East Gateway and Railings of Bharhut Stupa. Sculptured railings: 115 BCE, toranas: 75 BCE. The Great Stupa at Sanchi. Decorated toranas built from the 1st c. BCE to the 1st c. CE. Amaravati stupa, 1st-2nd century CE. The Dharmarajika Stupa, a semi-hemespherical, classic Indian-type Gandharan stupa, probably dated to the 3rd century BCE. 1) The Dharmarajika Stupa with a near-Indian design of a semi-hemispheric stupa almost directly on the ground surface, probably dated to the 3rd century BCE. Similar stupas are the Butkara stupa, the Manikyala stupa or the Chakpat stupa. 2) The Saidu Sharif Stupa, pillared and quincunxial, with a flight of stairs to a dome elevated on a square platform. Many Gandhara minutiures represent this spectacular type (1st century CE). 3) The Loriyan Tangai Stupa, with a elongated shape and many narrative reliefs, in many way the Classical Gandharan stupa (2nd century CE). 4) The near-pyramidal Jaulian stupa (2nd century CE). 5) The cruciform type, as in the Bhamala Stupa, with flights of stairs in the four cardinal directions (4th century CE). 6) The towering design of the second Kanishka stupa (4-5th century CE). A model resembling the Saidu Sharif Stupa, with square base and four columns (1st century CE). Loriyan Tangai decorated stupa, in the Greco-Buddhist art of Gandhara (2nd century CE). A tower-shaped stupa, thought to be the design of the second (rebuilt) Kanishka stupa. Jaulian monastery. The Mahabodhi Temple in 150-200 CE. The Mahabodhi Temple: a stepped pyramid with round stupa on top. It is thought that the temple in the shape of a truncated pyramid may have derived from the design of the stepped stupas which developed in Gandhara. The Mahabodhi Temple in Bodh Gaya is one such example, formed of a succession of steps with niches containing Buddha images, alternating with Greco-Roman pillars. The structure is crowned by the shape of an hemispherical stupa topped by finials, forming a logical elongation of the stepped Gandharan stupas such as those seen in Jaulian. Although the current structure of the Mahabdhodi Temple dates to the Gupta period (5th century CE), the "Plaque of Mahabhodi Temple", discovered in Kumrahar and dated to 150-200 CE based on its dated Kharoshthi inscriptions and combined finds of Huvishka coins, suggests that the pyramidal structure already existed in the 2nd century CE. This is confirmed by archaeological excavations in Bodh Gaya. This truncated pyramid design also marked the evolution from the aniconic stupa dedicated to the cult of relics, to the iconic temple with multiple images of the Buddha and Bodhisattvas. This design was very influential in the development of later Hindu temples. The Gandharan tower-stupa (4th century CE). 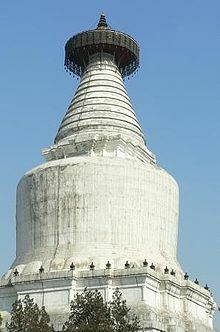 The Chinese Songyue Pagoda (523 CE) is thought to derive from the Gandharan tower-stupa model. Stupa architecture was adopted in Southeast and East Asia, where it became prominent as a Buddhist monument used for enshrining sacred relics. The Indian gateway arches, the torana, reached East Asia with the spread of Buddhism. Some scholars hold that torii derives from the torana gates at the Buddhist historic site of Sanchi (3rd century BCE – 11th century CE). In Tibet, the stupa became the chörten. and the pagoda in East Asia. The pagoda has varied forms that also include bell-shaped and pyramidal styles. In the Western context, there is no clear distinction between a stupa and a pagoda. In general, however, "stupa" is the term used for a Buddhist structure in India or Southeast Asia while "pagoda" refers to a building in East Asia which can be entered and which may be secular in purpose. Stupas were built in Sri Lanka soon after Devanampiya Tissa of Anuradhapura converted to Buddhism. The first stupa to be built was the Thuparamaya. Later, many more were built over the years, some like the Jetavanaramaya in Anuradhapura, being one of the tallest ancient structures in the world. The Asian words for pagoda (tāin Chinese, t'ap in Korean, tháp in Vietnamese, tō in Japanese) are all thought to derive from the Pali word for stupa, thupa, the Sanskrit pronunciation being stupa. In particular the type of the tower-like stupa, the last stage of Gandharan stupa development, visible in the second Kanishka stupa (4th century), is thought to be the precussor of the tower stupas in Turkestan and the Chinese pagodas such as Songyue Pagoda (523 CE). The earliest archaeological evidence for the presence of Buddhist stupas dates to the late 4th century BCE. In India, Sanchi, Sarnath, Amaravati and Bharhut are among the oldest known stupas. The tallest is the Jetavanaramaya Stupa located in the ancient city of Anuradhapura, Sri Lanka with a height of 120 m (400 ft). The Swat Valley hosts a well-preserved stupa at Shingardar near Ghalegay; another stupa is located near Barikot and Dharmarajika-Taxila in Pakistan. In Sri Lanka, the ancient city of Anuradhapura includes some of the tallest, most ancient and best preserved stupas in the world, such as Ruwanwelisaya. The most elaborate stupa is the 8th century Borobudur monument in Java, Indonesia. The upper rounded terrace with rows of bell-shaped stupas contained Buddha images symbolizing Arūpajhāna, the sphere of formlessness. The main stupa itself is empty, symbolizing complete perfection of enlightenment. The main stupa is the crown part of the monument, while the base is a pyramidal structure elaborated with galleries adorned with bas relief scenes derived from Buddhist texts and depicting the life of Gautama Buddha. Borobudur's unique and significant architecture has been acknowledged by UNESCO as the largest Buddhist monument in the world. It is also the world’s largest Buddhist temple. as well as one of the greatest Buddhist monuments in the world. A Jain stupa was excavated at Mathura in the 19th century. The Shwedagon in Yangon, Myanmar is one of the largest and most holy stupas. The Benalmádena Stupa is the largest stupa in Europe. It is 33 m (108 ft) high and was inaugurated on 5 October 2003, the final project of Buddhist master Lopon Tsechu Rinpoche. Rinpoche built his first stupa at Karma Guen near Malaga in 1994, a symbol of peace and prosperity for Spain. Rinpoche went on to build 16 more stupas in Europe before his death in 2003. A stupa was built on the ground of the Kalachakra Kalapa Centre in southwest Styria, Austria, between 2000 and 2002. Relic stupa, in which the relics or remains of the Buddha, his disciples, and lay saints are interred. Object stupa, in which the items interred are objects belonged to the Buddha or his disciples, such as a begging bowl or robe, or important Buddhist scriptures. Commemorative stupa, built to commemorate events in the lives of Buddha or his disciples. Symbolic stupa, to symbolise aspects of Buddhist theology; for example, Borobudur is considered to be the symbol of "the Three Worlds (dhatu) and the spiritual stages (bhumi) in a Mahayana bodhisattva's character." Votive stupa, constructed to commemorate visits or to gain spiritual benefits, usually at the site of prominent stupas which are regularly visited. View of the Wat Phra Kaew complex from the northeast, temple complex of the Emerald Buddha with stupas. "The shape of the stupa represents the Buddha, crowned and sitting in meditation posture on a lion throne. His crown is the top of the spire; his head is the square at the spire's base; his body is the vase shape; his legs are the four steps of the lower terrace; and the base is his throne." To build a stupa, Dharma transmission and ceremonies known to a Buddhist teacher are necessary. The type of stupa to be constructed in a certain area is decided together with the teacher assisting in the construction. Sometimes the type is chosen directly connected with events that have taken place in the area. The sharing of the relics of the Buddha. Greco-Buddhist art of Gandhara, 2-3rd century CE. ZenYouMitsu Temple Museum, Tokyo. Buddha relics from Kanishka's stupa in Peshawar, Pakistan. These surviving relics are now housed in Mandalay, Myanmar. All stupas contain a treasury filled with various objects. Small clay votive offerings called tsatsas in Tibetan fill most of the treasury. Creation of various types of tsatsas is a ceremony itself. Mantras written on paper are rolled into thin rolls and put into small clay stupas. One layer of tsatsas is placed in the treasury, and the empty space between them is filled with dry sand. On the thus created new surface, another layer of tsatsas is made, and so on until the entire space of the treasury is full. The number of tsatsas required to completely fill the treasury depends on its size and the size of the tsatsa. For example, the Kalachakra stupa in southern Spain contains approximately 14,000 tsatsas. Jewellery and other "precious" objects are also placed in the treasury. It is not necessary that they be expensive, since it is the symbolic value that is important, not the market price. It is believed that the more objects placed into the stupa, the stronger the energy of the stupa. An important element in every stupa is the "Tree of Life". This is a wooden pole covered with gems and thousands of mantras; it is placed in the central channel of the stupa. It is positioned during a ceremony or initiation, where the participants hold colorful ribbons connected to the Tree of Life. Together, the participants make their most positive and powerful wishes, which are stored in the Tree of Life. In this way the stupa is charged, and starts to function. Building a stupa is considered extremely beneficial, leaving very positive karmic imprints in the mind. Future benefits from this action result in fortunate rebirths. Fortunate worldly benefits will be the result, such as being born into a rich family, having a beautiful body, a nice voice, being attractive, bringing joy to others, and having a long and happy life in which one's wishes are quickly fulfilled. On the absolute level, one will also be able quickly to reach enlightenment, the goal of Buddhism. Destroying a stupa, on the other hand, is considered an extremely negative deed, similar to killing. Such an action is said to create massive negative karmic imprints, leading to serious future problems. It is said this action leaves the mind in a state of paranoia after death has occurred, leading to totally unfortunate rebirths. Stupas in Tibet and Bhutan are usually called chorten in English, reflecting the term in the Tibetan language. There are eight different kinds of stupas in Tibetan Buddhism, each referring to major events in the Buddha's life. Also known as "Stupa of Heaped Lotuses" or "Birth of the Sugata Stupa," this stupa refers to the birth of Gautama Buddha. "At birth Buddha took seven steps in each of the four directions" (East, South, West and North). In each direction lotuses sprang up, symbolizing the brahmavihāras: love, compassion, joy and equanimity. The base of this stupa is circular and has four steps, and it is decorated with lotus-petal designs. Occasionally, seven heaped lotus steps are constructed. These refer to the seven first steps of the Buddha. Also known as the "Stupa of the Conquest of Mara", this stupa symbolizes the 35-year-old Buddha's attainment of enlightenment under the bodhi tree in Bodh Gaya, where he conquered worldly temptations and attacks, manifesting in the form of Mara. This stupa is also known as the "Stupa of Many Gates". After reaching enlightenment, the Buddha taught his first students in a deer park near Sarnath. The series of doors on each side of the steps represents the first teachings: the Four Noble Truths, the Six Pāramitās, the Noble Eightfold Path and the Twelve Nidānas. At 42 years of age, Buddha spent a summer retreat in the Tuṣita Heaven where his mother had taken rebirth. In order to repay her kindness he taught the dharma to her rebirth. Local inhabitants built a stupa in Sankassa in order to commemorate this event. This type of stupa is characterized by having a central projection at each side containing a triple ladder or steps. Also known as the "Stupa of Conquest of the Tirthikas", this stupa refers to various miracles performed by the Buddha when he was 50 years old. Legend claims that he overpowered maras and heretics by engaging them in intellectual arguments and also by performing miracles. This stupa was raised by the Lichavi kingdom to commemorate the event. This stupa commemorates the Buddha's resolution of a dispute among the sangha. A stupa in this design was built in the kingdom of Magadha, where the reconciliation occurred. It has four octagonal steps with equal sides. This stupa commemorates Buddha's successful prolonging of his life by three months. It has only three steps, which are circular and unadorned. This stupa refers to the death of the Buddha when he was 80 years old. It symbolizes his complete absorption into the highest state of mind. It is bell-shaped and usually unornamented. A ninth kind of stupa exists, the Kalachakra stupa. Its symbolism is not connected to events in the Buddha's life, but instead to the symbolism of the Kalachakra Tantra, created to protect against negative energies. Swat District is a small place with a large number of ancient stupas. The largest stupa of the Indian subcontinent is in Shingardar. The Great Stupa at Sanchi, which contained the relics of Buddha, the oldest known stupa. An early stupa at Guntupalle, probably Maurya Empire, third century BCE. Chorten near Potala Palace, Lhasa, Tibet. ^ Encyclopedia.com. Credited to James Stevens Curl, A Dictionary of Architecture and Landscape Architecture, 2000, originally published by Oxford University Press 2000. ^ "Buddhist Art and Architecture: Symbolism of the Stupa / Chorten". 2006-08-14. Retrieved 2013-01-07. ^ "THE BUDDHIST STUPA: ORIGIN AND DEVELOPMENT". 2005-01-13. Retrieved 2013-01-07. ^ "It is probably traceable to a common cultural inheritance, stretching from the Mediterranean to the Ganges valley, and manifested by the sepulchres, conical mounds of earth on a circular foundation, of about the eighth century B.C. found in Eritrea and Lydia." Rao, P. R. Ramachandra (2002). Amaravati. Youth Advancement, Tourism & Cultural Department Government of Andhra Pradesh. p. 33. ^ On the hemispherical Phenician tombs of Amrit: Coomaraswamy, Ananda K. (1972). History of Indian and Indonesian art. p. 12. ^ Commenting on Gisbert Combaz: "In his study L'évolution du stupa en Asie, he even observed that "long before India, classical Orient was inspired by the shape of the tumulus for constructing its tombs: Phrygia, Lydia, Phenicia ." in Bénisti, Mireille; K, Thanikaimony (2003). Stylistics of Buddhist art in India. Indira Gandhi National Centre for the Arts. p. 12. ISBN 9788173052415. ^ a b c Encyclopædia Britannica (2008), Pagoda. ^ "De l'Indus a l'Oxus: archaeologie de l'Asie Centrale", Pierfrancesco Callieri, p212: "The diffusion, from the second century BCE, of Hellenistic influences in the architecture of Swat is also attested by the archaeological searches at the sanctuary of Butkara I, which saw its stupa "monumentalized" at that exact time by basal elements and decorative alcoves derived from Hellenistic architecture". ^ a b Le, Huu Phuoc (2010). Buddhist Architecture. Grafikol. pp. 179–180. ISBN 9780984404308. ^ Japanese Architecture and Art Net Users System (2001), torii. ^ "Stupa - Bhutanese, Nepalese, Tibetan Style Chortens or Stupa is the symbol of enlightened mind". Bhutan Majestic Travel. 2013-01-17. Archived from the original on 2012-12-31. Retrieved 2013-01-17. ^ "Tallest stupa". Guinness World Records. Retrieved 2018-01-08. ^ "Largest Buddhist temple". Guinness World Records. Guinness World Records. Retrieved 27 January 2014. ^ Purnomo Siswoprasetjo (July 4, 2012). "Guinness names Borobudur world's largest Buddha temple". The Jakarta Post. Archived from the original on 5 November 2014. Retrieved 27 January 2014. ^ "Borobudur Temple Compounds". UNESCO World Heritage Centre. UNESCO. Retrieved 28 December 2008. ^ Smith, Vincent Arthur (1901). The Jain stûpa and other antiquities of Mathurâ. Allahabad: KFrank Luker, Superintendent, Government Press, North-Western Provinces and Oudh. ^ friends, Venerable Kusalo Bhikkhu - with help from his teachers and. "Stupa construction at Amaravati Buddhist Monastery". www.buddhamind.info. Retrieved 2018-11-25. ^ a b Le Huu Phuoc (March 2010). Buddhist Architecture. Grafikol. p. 140. ISBN 978-0-9844043-0-8. Retrieved 8 December 2011. ^ "Introduction to stupas". stupa.org. Retrieved 2009-04-18. ^ a b c d e f g h i "Miracle Stupa - Stupa". stupa.pl. Retrieved 2009-04-18. ^ a b "Benefits Resulting from the Building of Stupas". stupa.org. Retrieved 2009-04-18. ^ "Kalachakra Stupa". karmaguen.org. Archived from the original on December 5, 2008. Retrieved 2009-04-18. Chandra, Pramod (2008), South Asian arts, Encyclopædia Britannica. Das Gupta, P. C. (October 1977). "Stupa in Mexican Art". Jain Journal. 12 (2): 51–60. Mitra, D. (1971). Buddhist Monuments. Sahitya Samsad: Calcutta. ISBN 0-89684-490-0. Smith, Vincent Arthur (1901). The Jain stupa and other antiquities of Mathura. Allahabad. Wikimedia Commons has media related to Stupas.